ADULT STAND-UP MAGIC SHOW This show, called "Magic: Funny Side Up" is Jason's full, 45 minute action-packed stand-up adult magic show. This is the type of show that is typically performed for corporate events, after dinner banquets, sales meetings, award dinners, comedy clubs, cruise ships, holiday parties, and retirement parties. This show is designed for adults although it is appropriate for all audiences. In the show Jason makes a signed playing card fly to his pocket, forehead, wallet, shoe, fly, and folded up back in the box. He lights a borrowed $100 bill on fire and gives his "victim" a chance to win his money back. He cuts himself in half with a clothesline, produces a two pound rock out of his shoe, Cuts and restores the microphone cord, swallows a four-foot long balloon animal balloon, and escapes from a strait jacket in "Escape the top 40" Jason's award winning version of Houdini's classic escape. A PG and a PG-13 version of this show are both available. The emphasis of this show is on situation comedy and interaction with members of the audience. Book Jason and watch your worries disappear with this show. Jason arrives with a complete state of the art PA system, which allows the performer to control the music and sound effects during the show. Jason can entertain your group of 30 to 300 people for 15 to 45 minutes. To book this type of entertainment for your next event click here. For more information on walk-around magic that can be performed before or after the above show click here. 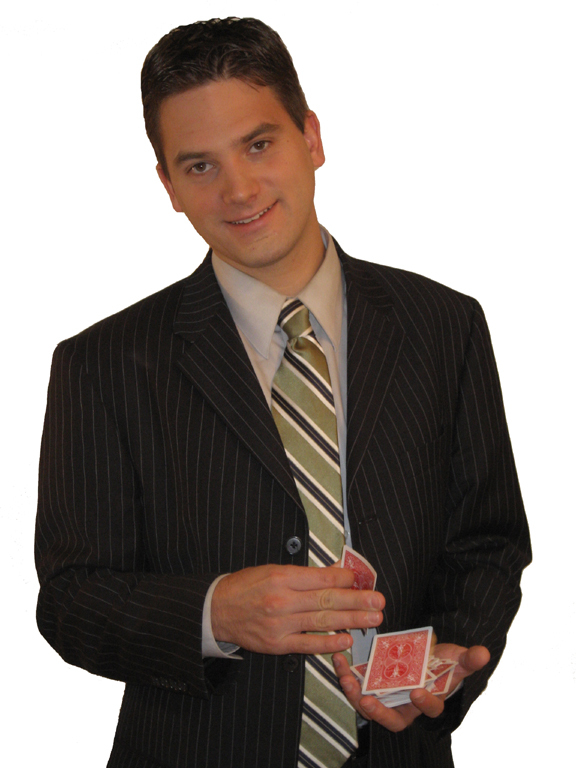 ADULT STROLLING MAGIC Great as an addition to any show or on its own Jason will amaze and entertain your group in a more intimate setting. He can walk-around from table to table during the dinner hour or mingle with your guests during cocktails. This type of strolling entertainment is usually performed before a more formal banquet show or on its own at weddings, hospitality suits, open houses, graduation parties, grand openings, trade shows, and anywhere you still want great entertainment but guests are arriving throughout the day other is no time for a formal show. At all types of events where there is music and dancing Jason can entertain the people that don't dance and give them a reason to hang around after dinner is over. 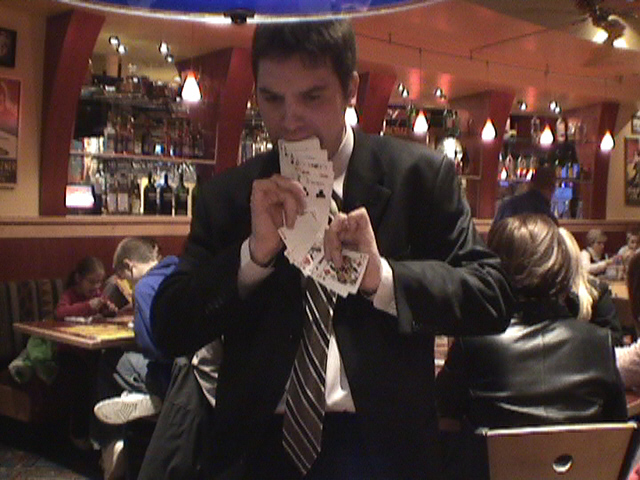 Jason does very fancy Vegas style card magic, including a signed card to everywhere routine, spoon bending, rock in shoe, and other tricks with coins, a dollar bill, his tie, rope, a super ball, Jumbo cards, and other everyday objects. Jason's walk- around magic is a great ice breaker and the perfect addition to any event or party. Hiring Jason will make your event more memorable. Jason gets people talking while witnessing miracles inches from their noses. This type of magic can kick-off any event and insure a perfect evening. Jason Abbott is very experienced doing close-up magic and has a gag or "line for everything" that can happen in this type of environment. 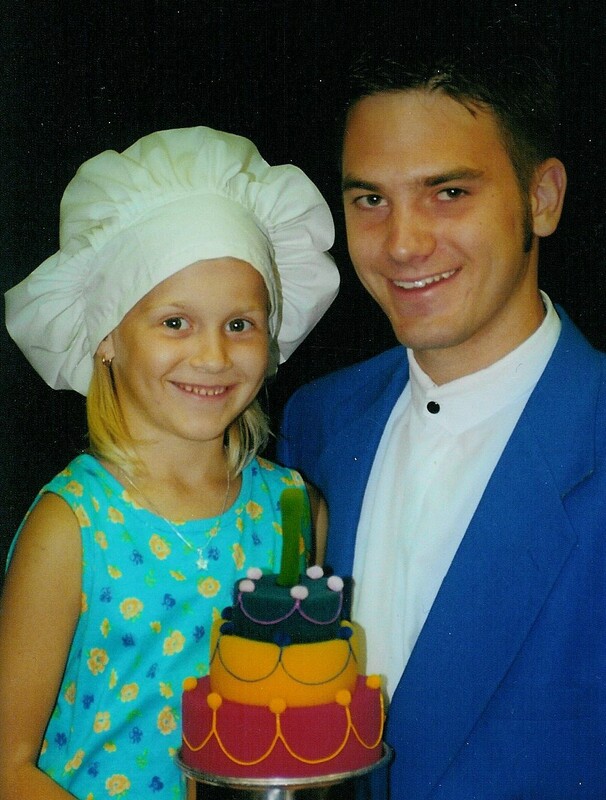 He has performed weekly at various restaurants including Red Lobster, Fire Academy, Pizza Uno's, Macaroni Grill, Max and Erma's, Station 885, Volcano Grill, Boulders, and Red Robin for the past 10 years. Currently he can be seen on Monday nights at the Clinton Township Red Robin and at the Brighton location on Wednesday nights. If you would like a see a video of this type of entertainment performed at Red Robin click here. For more information and to book this type of entertainment click here. 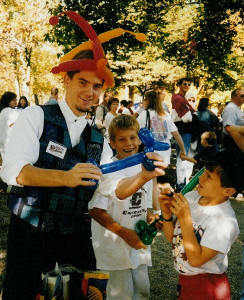 FAMILY MAGIC SHOW This show is a full 45 minute, action packed, family magic show. It is appropriate for groups up to 300 people and is entertaining for children and adults alike. In this show Jason makes multiple handkerchiefs change color, magically links five headbands together to form one giant headband, produces an endless supply of bananas at his fingertips, links and unlinks eight solid steel rings, correctly predicts a chosen card from an "invisible deck", produces a real live bunny that the kids can pet at the end of the show, and does his hilarious, award winning straitjacket escape called “Escape the Top Forty.” This show comes complete with a full sound system and is designed for company picnics, school assemblies, libraries, communion parties, blue & gold banquets, and outdoor events. If you would like to see a video of this type of show click here. For more information and to book this show click here. FAMILY WALK-AROUND MAGIC Jason can also entertain a family audience with walk-around magic. Great as an addition to any show or on its own Jason will amaze and entertain your group in a more intimate setting. 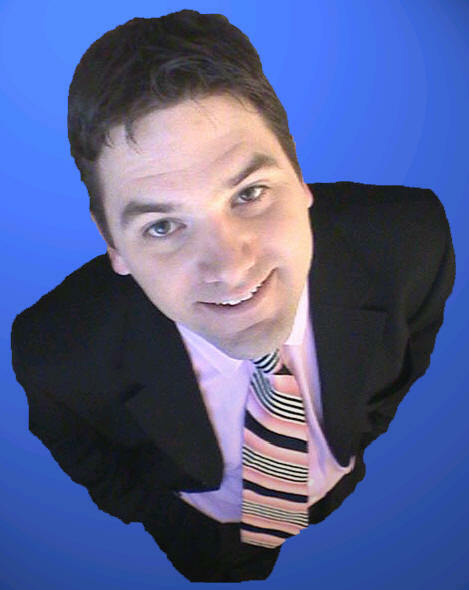 Perfect for pancake breakfasts, church events, Jason Abbott is very experienced doing close-up magic. He has performed weekly at various restaurants including Red Lobster, Fire Academy, Pizza Uno's, Macaroni Grill, Max and Erma's, Station 885, Volcano Grill, Boulders, and Red Robin on a weekly basis for the past 10 years. Currently he can be seen on Monday nights at the Clinton Township Red Robin and at the Brighton Red Robin on Wednesday nights. Jason does very fancy Vegas style card magic, including a signed card to everywhere routine, spoon bending, rock in shoe, and other tricks with coins, a dollar bill, his tie, a napkin, and balloon animals for the kids. This type of magic is performed inches from the audiences nose and is truly amazing. To see a video of this type of magic click here. For more information and to book this type of entertainment click here. BIRTHDAY PARTY MAGIC SHOW In this show your child is the star of the show. They help with the magic which makes them feel special. This show is written for 5-7 year olds and is appropriate for children 4 to 10. 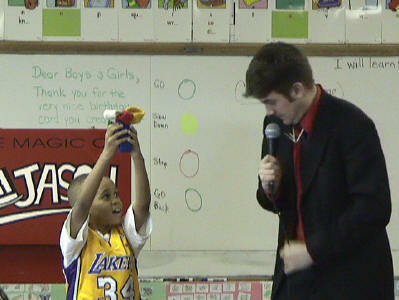 This is Jason's original magic show and is what got him to where he is today. Written back in 1997 it is time tested and guaranteed to make the kids laugh out loud. In this show Jason makes multiple handkerchiefs change color, magically links five headbands together to form one giant headband, produces an endless supply of bananas at his fingertips, links and unlinks eight solid steel rings, correctly predicts a chosen card from an "invisible deck", Causes a fake birthday cake to appear out of nowhere, does some funny puppetry with Puff the Magic Rabbit and for the finale turns this rabbit puppet into a real live bunny that the kids can pet at the end of the show. This is Jason's most affordable show and is perfect for birthday parities, daycares, and other events with 30 children or less. If you would like to see a live video of this type of show click here. For more information and to book this type of show click here. BALLOON ANIMAL TWISTING In addition to amazing magic shows Jason also makes the most amazing balloon animals and quicker than thought possible. 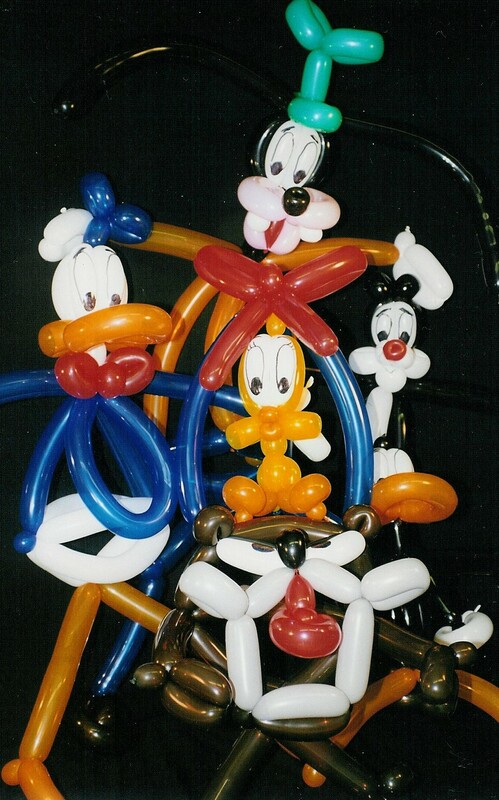 Usually booked as an add on to a magic show, Jason can make a large variety of balloon creations for your guests. From simple one balloon animals to complex multiple balloon hats and even cartoon characters. Boosting over 100 balloons an hour your guests won't have to wait long to play with there balloon. Jason has performed at countless fairs and festivals and has made balloons for over 15,000 people. His hands are tired. For kids balloons are always a hit. Boys want swords, girls want bunnies, For teens they get them to look cool (big hats and hearts) The same is true for adults, They get them to be the crazy one at the party. More elaborate creations are used. Bottom line everyone wants a balloon. For more information and to book this type of entertainment click here.